Broadband MP4 kunospe_bb.mp4 (4.4MB), suitable for iPods and computer downloads. Rosalie Kunoth-Monks was the lead female actor in the first Australian full-length colour feature film, Jedda (dir. Chauvel, 1955), which for her was not a good experience (see her comments on-line in the Australian Biography Kunoth-Monks video clip titled, Jedda). She married Bill Monks in 1970. Together they set up the first exclusively Aboriginal family group home, in the Melbourne suburb of Essendon. After this, they moved back to Alice Springs, in the Northern Territory, where she continued her involvement in social work, and later, political activism. For some time she was a special adviser to the Northern Territory Chief Minister in relation to the portfolio of Aboriginal Affairs. 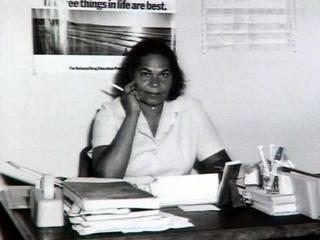 Rosalie Kunoth-Monks has never been afraid to speak out and to live her life for the benefit of her people. She believes ‘I have to do my little bit to be in there’ and that in tandem with all others responsible for ‘[her] young ones’, they will make a more loving and accepting future. Explain why Rosalie began to speak out about what she condidered was happening to Aboriginal people. Define and comment on the two main factors Rosalie considered were destroying Aboriginals. How do you think it is possible to counteract these two factors if they are deeply entrenched into the ways people live? Research and prepare an informative magazine-style article (or collection of interrelated items that would form the basis for a magazine profile) about Rosalie’s public campaigns and her work in general as a fighter for Indigenous rights. This should include references to her role in fighting the construction of a dam in an area of traditional sacred sites, and the outcome of this battle. Your work should be presented in desktop publishing format, and may be illustrated with photographs. Taking the previous activity as a starting point, what would be your reaction if a similar event to the building of a dam were planned for your local region, where a sacred site is placed under threat, or a natural habitat may be cleared for exclusive housing and tourist hotels etc? In groups plan a campaign of legal and non-violent protest, publicity, fund-raising, action and political debate to save your valuable resource. This may involve the preparation of speeches and debates, media interviews and advertisements, information posters, letterbox flyers, lobbying of local, state and national politicians through letters and petitions, collecting scientific and other specialist evidence to support your case etc. Following from the previous activity, each student in the group is to write their own concluding report of the campaign and their role in it, assessing its relative effectiveness, strengths and weaknesses.